It had been snowing for hours. Hare stood in the garden of the little house at the end of the wood, watching the snowflakes tumbling down like white feathers from the grey sky. "Whatever are you doing, Hare?" cried Squirrel, who was sitting close to the fire. "Come in! You'll catch cold." "I am catching cold, and eating it too," replied Hare, happily. Since publication of the first Little Grey Rabbit book in 1929, the series has become a classic of children's literature. The popularity of Alison Uttley's magical stories and Margaret Tempest's lively illustrations meant that generations of children grew up with Grey Rabbit, Squirrel, Hare, Moldy Warp and little Fuzzypeg. Now Templar brings the story of Little Grey Rabbit's Christmas to today's young readers – join the festivities as the animals prepare for a truly special Christmas as Little Grey Rabbit goes to market to buy her friends a secret gift – a fine scarlet sledge! 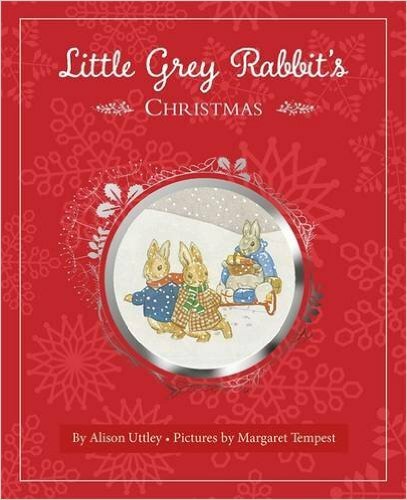 When I was young, I was Little Grey Rabbit's number one fan and now Templar has republished Little Grey Rabbit's Christmas. Hooray! It has all the beautifully detailed and evocative pictures that I remember, and as far as I can see the text is unchanged, too. The only major difference is the book's cover, which is now a gorgeous, Christmassy red with silver foil detailing. For those who don't know, Little Grey Rabbit is a thoroughly lovable and sensible rabbit who lives in a cosy home in the British countryside with vain Squirrel and silly Hare. In this story, Christmas is coming and we see the three friends preparing for the big day. Little Grey Rabbit has a wonderful gift for Hare and Squirrel – a beautiful scarlet sledge. Unfortunately Hare soon manages to lose it but, of course, the story ends happily when the sledge is returned. The story is long so it's not really suitable for very young children. It gives a flavour of long-gone, traditional Christmases with carol singers, holly balls and simple gifts that will probably astonish children used to finding heaps of presents under the tree on Christmas morning. Unluckily, Little Grey Rabbit fills Hare's and Squirrel's stockings when they were expecting Santa Claus to do it, so you'll want to think up a reason to explain this if your children still believe. But this is still a lovely book and one that I'll definitely be sharing with my grandchildren. This sounds like a wonderful story to share with children. Since it is long a chapter or two could be read each night leading up to Christmas. Lovely review!